Since 2005, Hyundai Forklifts Australia has been a successful part of the global equipment network for Hyundai Heavy Industry. As we move forward, we will continue to evolve and pursue excellence. As stated in our mission statement, our customers and environment are the central focus of our business. We work with our customers, striving to provide you with the quality products and services that meet your production needs and make your business more prosperous. Our equipment is designed to be economical and ergonomic with outstanding performance. Fuel efficiency, easy maintenance and operator comfort are all top priority in a Hyundai machine. We also offer a standard warranty that is best in the industry and our comprehensive Hyundai Intelligent Management System (HIMS) to insure your customer satisfaction and optimum equipment performance. Our product lines and customer service tools are constantly being improved and expanded, including the introduction of our new range of warehousing equipment in mid 2016. This series focuses on quality and now brings Hyundai to the industry forefront able to support all of our customers materials handling requirements from small pedestrian machines through to our 25 tonne container handlers. Our new warehouse range will be supported by the same factory warranty as our existing range, providing our customers with comfort we stand behind the quality of our product. 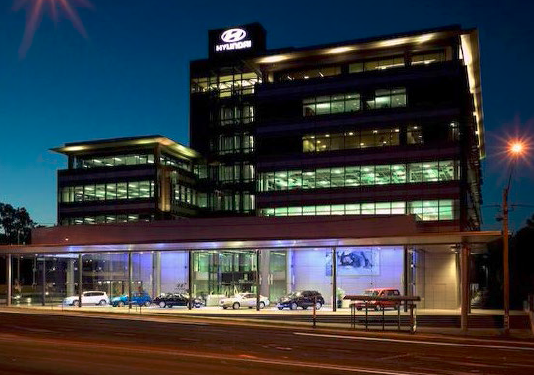 We recently relocated our main office to Hyundai Towers in North Ryde. Not only are we continuously working to develop our products and services, we also have a constant goal to add new dealers and distributors throughout Australia. We want to make sure you have access to our products when and where you need it. Our goals are set high and our talented staff and strong dealer network working together will be the driving force behind our future successes. We are confident that Hyundai Forklifts has what it takes to move you further. We offer a wide variety of Hyundai branded merchandising. Ranging from miniatures to clothes. Please visit one of our dealers across Europe for more information. Through global management Hyundai Heavy Industries is very alert on the continuous changes that characterize our world economy. HHI is expanding rapidly production facilities, R&D centers and subsidiaries in Asia, Europe, the Middle East, Africa and the United States. Hyundai Edge is the quarterly magazine of the global Hyundai Construction Equipment division.